Well, you see, I had an idea. Some of my ideas are great. And then there are ideas like this one. It starts off promising, and then, well, smoosh. So let me explain this cupcake misadventure. I thought, hey New Year’s! Times Square… ball dropping… Count Down Cupcakes! 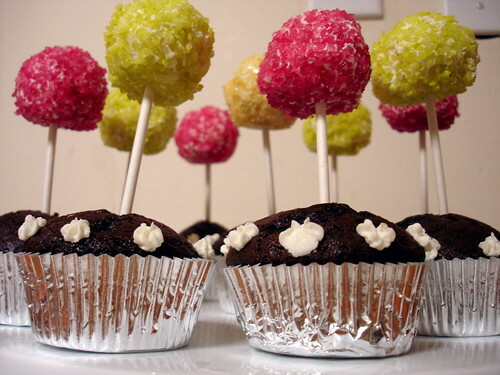 The idea was to have a sugar crystal frosting ball suspended over chocolate cupcakes. You unwrap the cupcake, pull the stem through the bottom and voila! Your crystal ball descends and rings in the new year. You can see this to the left. But oh, what a smooshy new year it is. The frosting balls were really heavy, wobbling on their sticks and making larger and larger holes in the cupcakes. As they warmed they slid down their little sticks, ringing in 2007 on their own around 5:30 pm. Something had to be done, and fast. Ah well! Happy New Year! VeganYumYum wishes you good tidings and strange little cupcakes throughout the 2007! Well it was a fabulous idea! I wandered over here from the PPK and was reading your archives – I know this is an old entry, but it made me laugh, so I had to leave a comment. Going through the archives, totally cute idea! too bad it didn’t work. They almost look like little trees. very cute.